It's Tuesday and that means Top Ten day over at The Broke and the Bookish! Head over there and check out all the links. You can also see my list of Top Ten Kids/Teen Books I Want to Reread over at Great Books for Kids and Teens. Replay by Ken Grimwood - even though I have read it three times, I know I will reread it! The Time Traveler's Wife by Audrey Niffenegger - one of my favorite books and it's complexity begs for a reread. Eat, Pray, Love by Elizabeth Gilbert - some day when I need inspiration. 12,000 Miles in the Nick of Time by Mark Jacobson - a memoir about traveling around the world with a family - maybe someday I can reread it while planning my own trip! On Writing by Stephen King - fabulous writing advice - maybe I should reread this one soon! The Poisonwood Bible by Barbara Kingsolver - another all-time favorite. She's Come Undone by Wally Lamb - I was blown away by this novel. Wuthering Heights by Emily Bronte - read it decades ago - I'd like to see if I still love it as much as I did then. Jane Eyre by Charlotte Bronte - also loved this one but am embarrassed to admit I sometimes confuse the details of this and the previous one - definitely need to reread. Many of these books just blew me away the first time I read them, and it would be fun to see if I still feel the same way the second time through. How about you? Which books would you most like to reread? I finished The Things They Carried by Tim O'Brien, a novel about the Vietnam war, though not in time for my book group discussion (I still went, though!). It's an excellent book on a very difficult subject. After that heavy read, plus the 1000-page book I read before it, I was ready for something short and light, and Middle School is Worse Than Meatloaf by Jennifer L. Holm was perfect! As the subtitle says, it's "a year told through stuff" - very creative and enjoyable. Now, I am reading Fahrenheit 451 by Ray Bradbury, in honor of Banned Books Week. I haven't read it since I was a teen and had forgotten just how brilliant it is. I finished a teen/YA audio, Bruiser, by one of my favorite YA authors, Neal Schusterman. My husband, Ken, finished The Roar by Emma Clayton, a middle-grade sci fi adventure that our son recommended. It's on my TBR shelf now. Ken is now reading The Passage by Justin Cronin, based on my recommendation. I'm already enjoying being able to talk to someone about it! Jamie, 17, spent the week lying on the couch, so he read a lot. He finished re-reading Brisingr by Christopher Paolini, in preparation for the final book to be released in November. Next, Jamie read Goliath by Scott Westerfeld, the final book in the Leviathan trilogy. This one will also pass through our entire family. Jamie has resumed re-reading a favorite series by Tamora Pierce, The Immortals, with Book 3, Emperor Mage. Finally, Jamie is reading Ishmael: An Adventure of the Mind and Spirit by Daniel Quinn for his World Lit class. Ken and I both read it years ago; he's enjoying it so far. Craig, 13, is reading The Golden Compass by Philip Pullman. 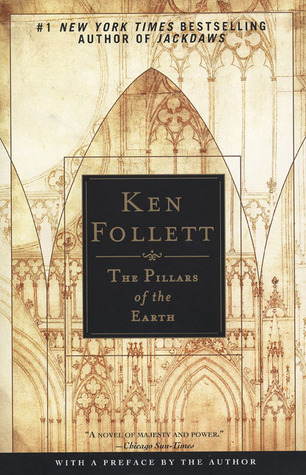 I posted a review of Ken Follett's The Pillars of the Earth last week, as well as my lists of Top Ten Books Everyone Has Read But Me, both here and at Great Books for Kids and Teens. And, although it is rare for me, I also joined a challenge, Fall Into Reading Challenge. 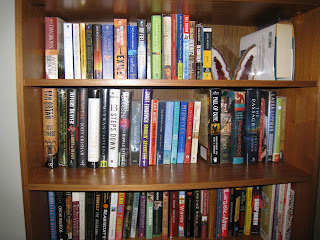 You can read my list of books to read for the challenge, as well as another list of kids/teen books to read for the challenge. OK, I normally don't DO challenges. My life is just too hectic. I find it hard enough to find time to read and blog, let alone taking on additional reading commitments. But this weekend, I came across a challenge that even I can do! 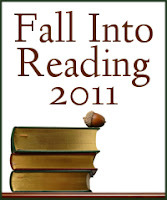 It's the Fall Into Reading 2011 Challenge, hosted at Callapidder Days, a new-to-me blog I just discovered and will be following. The rules are simple (you can read the whole list at the above link) - you make your own list, as long or as short as you like, of books you'd like to read this fall. I can do this! I chose quite a few short, light books since I just spent the summer reading several Big Books! All of these books (except the book group picks) are currently sitting on my very overloaded TBR shelf. I've included a photo so you can see just how "overbooked" I am. On the top two shelves, everything to the left of the gaps is mine - the short stacks to the right are my husband's - plus the entire bottom shelf...all TBRs waiting to be read! So, this will give me a good excuse to work down those piles. If you are interested in my Fall Into Reading list of kids/teen/YA books, head over to Great Books for Kids and Teens. Sounds like fun? Join in! 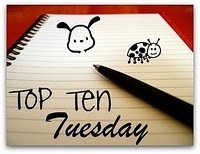 It's Tuesday and that means Top Ten day over at The Broke and the Bookish! Head over there and check out all the links. You can also see my list of Top Ten Kids/Teen Books Everyone Has Read But Me over at Great Books for Kids and Teens. Today's topic is Top Ten Books It Seems Everyone Has Read But Me. This is an easy one for me. I have a long list of classic authors I've never read. Romeo and Juliet – we read plenty of Shakespeare in high school but never this iconic play. Anything by Kurt Vonnegut, though Slaughterhouse Five is sitting on my TBR shelf, waiting. Dune – my husband’s favorite book of all-time and a sci fi classic. Carrie – I read almost every other Stephen King book published over the course of decades but never this first one. The Lord of the Rings – we have a beautiful leather-bound copy on the shelf, but I’ve never read it. Catch-22, though I really want to read it. Gone with the Wind – I’ve seen the movie – does that count? Ulysses – I keep thinking I must have read this in school, but I don’t remember reading it. How about you - what classic or popular books have you never read? I finally finished The Pillars of the Earth by Ken Follett! (pause for applause) It was excellent, and I enjoyed every minute of it, despite the fact that it took me over three weeks to read. Now I want to watch the TV mini series based on it. Last night, I started The Things They Carried by Tim O'Brien, a novel about the Vietnam war that I'm reading for one of my book groups. I will never finish it before Wednesday, but a friend assured me there's no surprise ending that will be ruined if I go to the discussion only halfway through the book. I am still listening to a teen/YA novel, Bruiser, by one of my favorite YA authors, Neal Schusterman. It's very good, and I'm getting through it fairly quickly. This is my current car/kitchen audio because it is on CD. I also started another audio book on my iPod, Trail of Crumbs: Hunger, Love, and the Search for Home by Kim Sunee. How could I pass this one up? It's a memoir about food by someone who grew up in New Orleans - that's three things I love in a book! My husband, Ken, had a lot of reading time since he was traveling. He read an Ed McBain mystery (not sure which one because he left it at his dad's house) - nice, quick paperback, perfect for a plane ride. At his dad's house, Ken borrowed and read The Andromeda Strain by Michael Crichton, one of his first novels. I've never read it either. Ken is now reading The Roar by Emma Clayton, a middle-grade sci fi adventure that our son has highly recommended. Jamie, 17, has embarked on another mission to re-read a favorite series. When we were in the bookstore last week, he saw that Christopher Paolini's 4th book in The Inheritance series is due out in November, so Jamie re-read Eragon and Eldest and is now reading Brisingr, so they will all be fresh in his mind when the last book is released. Craig, 13, is reading The Golden Compass by Philip Pullman. He had extra reading time last week because of standardized testing (students are supposed to read if they finish early). I posted just one review last week (told you I was busy! ): The Immortal Life of Henrietta Lacks by Rebecca Skloot which my neighborhood book group enjoyed and discussed last week. My neighborhood book group recently read The Immortal Life of Henrietta Lacks by Rebecca Skloot, a book I had long wanted to read, and everyone agreed it was fascinating and well written. On a scale of 1 to 10, our group rated it a solid 8. 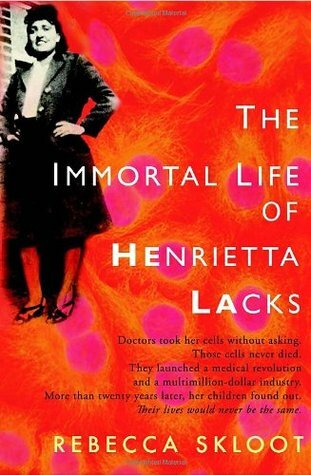 It is the nonfiction story of an African-American woman, Henrietta Lacks, who died of cervical cancer in 1951 and whose cells became invaluable to the medical community and are still in use today by scientists all over the world to study disease, vaccines, treatments, genetics, and more. There’s more to the story, though. Henrietta and her family had no idea that doctors had taken Henrietta’s cells for study (a common practice at the time) nor any idea what happened to those cells and how they changed the entire field of medicine. Henrietta’s family lived in poverty, unable to even afford adequate health care, while various corporations made millions of dollars selling her cells for research. Her daughter, Deborah, was a toddler when her mother died and knew virtually nothing about her mother’s life or death, until the author began research for this book. Our group found plenty to talk about. We discussed the medical implications of Henrietta’s cells, how we felt about her family and the way they’d been ignored, how medical practice has changed over the years, and we came back again and again to the questions of medical ethics raised in the book that are still relevant today. We also agreed that we’d all been enthralled by the photographs included in the book, of Henrietta and her family and descendants, the perfect accompaniment to Skloot’s talented writing, making the story come alive even more for us. This book reminded me in some ways of Laura Hillenbrand’s writing (author of Unbroken and Seabiscuit); Skloot has the same talent for telling a true story so that it is as compelling as a good novel. However, in this case, the author actually became a part of the story, as she got to know Henrietta’s family – and especially Deborah – and became more involved in helping them to understand their mother’s legacy. She tells Henrietta’s story alongside the tale of how she herself discovered and researched the story, alternating between Henrietta’s past, her own interactions with the family in the present, and the chronicle of Henrietta’s cells and their impact on medicine. It is an engrossing and thought-provoking book, sure to stay with you long after you finish reading it. Huh? What? Oh, it's Monday? Ooops! I had a terrible time sleeping last night (what my husband and I call the Sunday Night Spins, when all the stuff you need to do Monday morning spins around in your head Sunday night). So, I did know it was Monday today but totally forgot about my usual Monday blog posts! That gives you some idea of how insanely busy this week is shaping up to be. Yes, I am still reading Pillars of the Earth by Ken Follett. That was probably part of my problem last night - I kept the light on much too late reading! This book is so compelling and well-written - just as gripping as Follett's thrillers. I only have 300 pages left! I finished an audio book, Sometimes you Feel Like a Nut, a memoir by Jill Kargman that was sometimes hilarious and sometimes just cringe-worthy. I hope to find time to write a review this week (we'll see!). I started a new audio, a teen/YA novel, Bruiser, by one of my favorite YA authors, Neal Schusterman. So far, so good! My husband, Ken, re-read his #1 all-time favorite novel, Dune by Frank Herbert, in record time! Still his favorite. He's looking forward to reading some of its sequels next. But first, Ken chose an "airplane novel" for today since he's traveling, a small paperback by Ed McBain - sorry, I didn't catch the title before he left. He also wants to read The Passage, but that is definitely NOT an airplane book! Jamie, 17, re-read the first two books in a favorite series by Tamora Pierce, The Immortals, beginning with Book 1, Wild Magic, and Book 2, Wolf Speaker. Then, he had to take a break from that series because we no longer have Book 3 (we received a review copy years ago that was put together wrong and missing a bunch of pages!). So, Jamie switched gears to another old favorite series, The Farsala Trilogy by Hilari Bell. He read Books 2 and 3: Rise of a Hero and Forging the Sword. This is one of his all-time favorites. He made a trip to Barnes & Noble yesterday to use some birthday credits and spend his allowance, so he is well stocked up, for at least the next few weeks. Craig, 13, is thoroughly enjoying The Golden Compass by Philip Pullman. Now that he has to spend some time reading each day for school, he said to Jamie and I yesterday, "Wow! This book is really good now that I'm further into it." We said, "That's what we've been trying to tell you all summer!" He even asked to read for more time at bedtime last night. I'll have to remember that he does best with books that jump right into the action. I did manage some blogging last week. I posted a review of Wally Lamb's The Hour I First Believed here and a review of the creepy teen/YA novel Cryer's Cross by Lisa McMann at Great Books for Kids and Teens. I also posted lists of Top Ten Sequels I'm Dying to Read and Top Ten Kid/Teen Sequels We're Dying to Read, plus a summary of what I read in August. That's not bad for a busy month, especially since The Passage had almost 800 pages and a few weeks ago, I began another almost-1000 page book! So, that's just two grown-up books finished, one fiction and one nonfiction, plus two middle-grade novels and two teen novels, both audios - a nice mix. I enjoyed all of these books very much. My favorite? I guess that would have to be The Passage. And wonder of wonders, I have actually written and posted reviews of all of these, except The Immortal Life of Henrietta Lacks which I am purposely waiting to write until after our book group discussion next week. In fact, I've found that reading several huge books that last for weeks has allowed me to catch up on my review backlog. Where Are You Reading? Summary: With all those new reviews, I added several new locations to my map this month: Colorado (2), Tennessee, Montana, Nigeria, and France. So that brings my totals for the year to 13 different states and 7 countries. I have also discovered that many books are set in England, New York, and Connecticut! What were your favorite books read last month? She’s Come Undone by Wally Lamb still stands as one of my all-time favorite books, so I’m always eager to read other Lamb novels. This spring, I read The Hour I First Believed with one of my book groups. It’s a fictional account of two people affected by the Columbine shootings and how that one event had repercussions through their entire lives, though it is also an in-depth character study. Caelum Quirk is a teacher at Columbine High School, and his wife, Maureen, is the school nurse there. As the novel opens, they are struggling through a difficult time in their marriage and dealing with infidelity, bitterness, and resentment. Of course, the shooting in April 1999 ends any sense of normalcy and changes everything. Although Caelum was out of town at the time, Maureen was right in the middle of the shooting. She emerges with her life intact but deeply scarred emotionally. All of that happens at the beginning of the 700-page novel. The rest of the novel follows Caelum and Maureen as they try to put their lives back together and deal with both the aftermath of the tragedy, as well as all the issues they had before the shooting. The couple moves out to the Quirk family farm in Connecticut, to try to help Maureen heal and tie up some loose ends in Caelum’s family. From there, the action moves back and forth from the present into Caelum’s childhood and the events that shaped him and into the distant paths of Caelum’s ancestors who once lived on the farm and were instrumental in starting the women’s prison next door. If that sounds far ranging, well, it is. This is something of an epic, and the Columbine shooting is not really the main focus of the novel. It’s more of what Lamb specializes in – digging deeply into a character, finding out what makes him the way he is, how events in his life have shaped him, and how he will move forward. I felt the novel was probably a bit too long, as was Lamb’s other epic, I Know This Much Is True, but I enjoyed it and didn’t have trouble finishing it. It’s a fascinating look at human nature, and the in-depth research Lamb did on the Columbine shooting was captivating. He intricately weaves real-life events with the lives of his fictional characters, and the result is an engrossing read that stays with you long after you close the book. It's Tuesday and that means Top Ten day over at The Broke and the Bookish. Head over there and check out the long list of Top Ten links and join in the fun! Today's topic is Top Ten Sequels We're Dying to Read. This was a very easy list for me to make over at my other blog, Great Books for Kids and Teens, because so many kid/teen books are part of a series now. I could have made a list of 20 books there! But in going over the grown-up books I've read over the past several years, I realized something: I rarely read grown-up series. Most of the books I read are stand-alones, and I kind of like it that way - there's such a big commitment in reading a series! Sequel to The Passage by Justin Cronin (Sue) - talk about a commitment, a sequel to an 800-page book! Smokin’ Seventeen by Janet Evanovich (Sue) - a bit of fun fluff! Sequels to Tropic of Night by Michael Gruber (Ken) - there are 2 of them, out already. Any Elvis Cole novels by Robert Crais – haven’t been reading them in order (Ken). That's all we could come up with! What sequels are you looking forward to? This is pretty early for me on a holiday weekend, but I couldn't sleep this morning. I hope everyone is enjoying their Labor Day weekend! I'm glad to say good-bye to the heat and humidity of summer; fall is my favorite season. I will also be glad to get back into my weekday routine with the kids in school and have more time for writing, though of course, I will miss the easy-going summer evenings. I am still reading Pillars of the Earth by Ken Follett and thoroughly enjoying it. I am not quite halfway through this hefty volume yet, but it's been engaging every minute so far! I finished listening to the teen/YA audio book, Cryer's Cross by Lisa McMann, a creepy paranormal story. My son and I both enjoyed it very much. 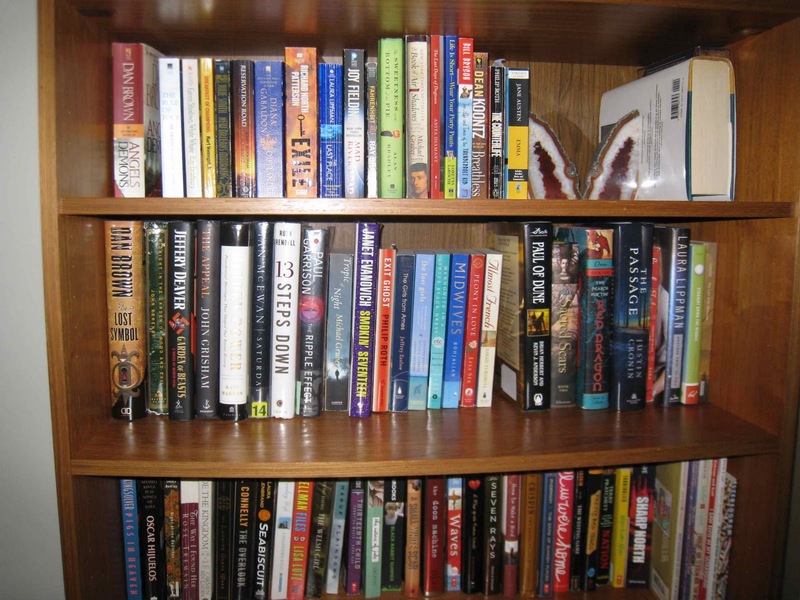 My husband, Ken, finished Tropic of Night by Michael Gruber and really enjoyed it - he moved it to my side of the TBR bookcase! Ken felt like a bit of comfort reading next, so he picked up one of his all-time favorite books, Dune by Frank Herbert, to re-read (for the third time maybe?). He's loving it! Jamie, 17, was couch-bound all week, so he made the best of it and did a lot of reading. He finished reading the Fablehaven series by Brandon Mull with Book 4, Secrets of the Dragon Sanctuary, and Book 5, Keys to the Demon Prison. He said it was a very satisfying end to one of his favorite series. He is now re-reading a favorite series by Tamora Pierce, The Immortals, beginning with Book 1, Wild Magic. Craig, 13, started back to school last week and back to required reading time. He is reading Philip Pullman's The Golden Compass, which he started this summer. I posted two new reviews this week, both of books I enjoyed very much: Little Bee by Chris Cleave and Alibi Junior High by Greg Logsted over at Great Books for Kids and Teens. I also posted my Top Ten List of Books on My TBR List for Fall and my Top Ten List of Kid/Teen Books on My TBR List for Fall.